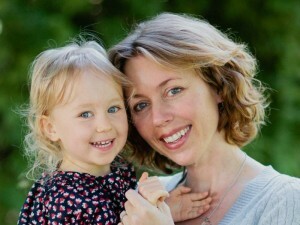 During these bewildering post-election days, a number of friends have told me that they are sorry I did not win my race for Sebastopol City Council. I appreciate their support. But I do not feel sad, or even disappointed, about the friendly race that we just ran in Peacetown, USA. In truth, I feel that it will not make very much of a difference to the people in our community whether I am on the City Council, or whether it is the hard-working candidates who got the most votes, Neysa Hinton and Michael Carnacchi. Instead I feel excited about the outcome of far more important local contests, whose successes will make a real difference to the lives of many of us here in Sonoma County. 1. 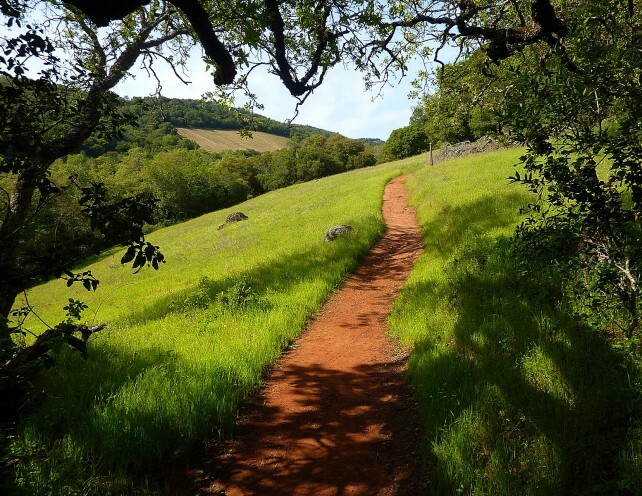 Winning a GMO-free Sonoma County creates the largest organic farming zone in the United States! Ten years ago, in response to the county’s first attempt to ban GMO farming, Monsanto and its chemical farming allies spent hundreds of thousands of dollars on toxic, deceptive media ads and lied their way to success. This time around, despite a similar ad campaign by the usual pesticide-promoting corporations and their farm industry cronies, the people beat the Corptocracy. Thankfully more than 100,000 voters thought differently. On November 8, this historic ballot initiative passed easily, 56 to 44%. 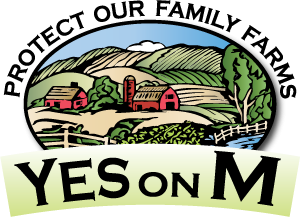 Sonoma County now completes the nation’s largest GMO-free growing zone, a contiguous 13,743 square mile area comprised of Mendocino, Humboldt and Trinity counties to our north and Marin County to our south. 2. Rejecting the “New Normal” and Restoring Library Hours. The unprecedented Monday closings and 25% cutback in Sonoma County Library hours are now in their sixth year. What started as a post-recession cutback has diminished a vital public service that is at the heart of our community commons. The Monday and evening closings in more than a dozen libraries countywide have directly impacted the lives of more than 100,000 regular library users, especially our youngest, oldest, and most financially challenged citizens. 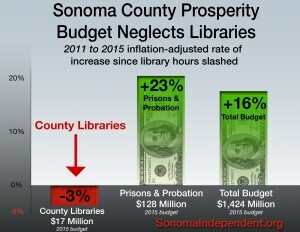 Because libraries are funded or, in this case, underfunded, by a dedicated parcel tax, our libraries became the only public service in Sonoma County that was significantly cut back during the recession and never restored. Through the Restore Library Hours campaign, I have been advocating for reopening the libraries for many of these six years. After four rounds of widely supported citizen petitions and a devastatingly narrow loss on a sales-tax ballot measure two years ago, these dramatically cutback hours threatened to become the new normal. With the crime rate falling, these priorities did not reflect the values of our community. 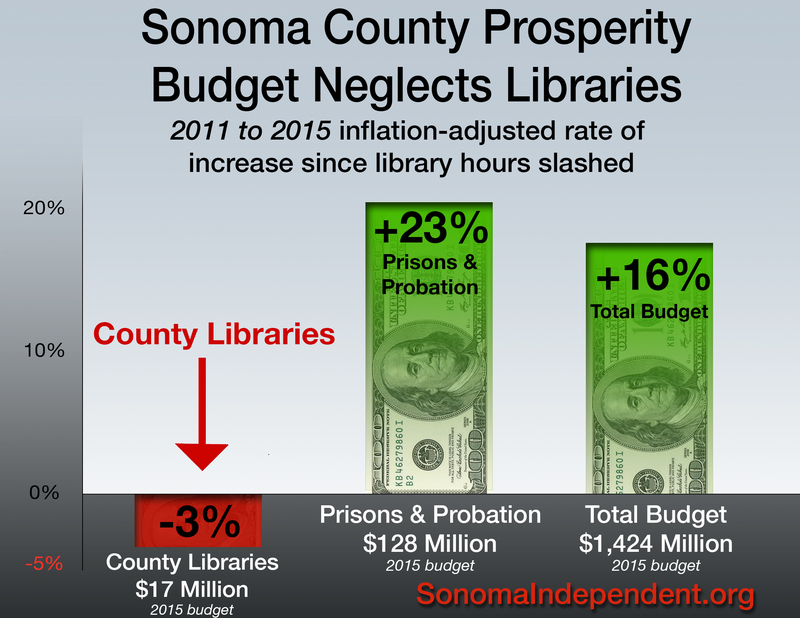 Thanks to large voter turnout, this year Sonoma County voters approved Measure Y, a tiny 1/8 of 1% countywide sales tax that will raise $12 million annually and save Sonoma County libraries. The measure needed at least 66.67% of the vote. It got 71%. Look for our library hours to be fully restored by July 1, if not sooner. Despite support for hospital closer Jim Horn from Sebastopol’s most powerful political insiders, the politically independent grassroots coalition of citizens and doctors prevailed on election day two years ago, when we elected the Doc and the Cop, and we prevailed again last week. Palm Drive Foundation Chair Gail Thomas received about 40% more votes than Jim Horn, preserving a board majority committed to doing the hard work necessary to keep our hospital open. This will not be easy, and it will take a village—our village-to make it happen. During the next three weeks I will be joining the Palm Drive Board in asking the intergovernmental LAFCO entity to rescind its misguided approval of the Palm Drive District’s “detachment” effort. 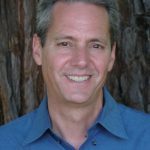 Led by Jim Horn and a dozen ardent anti-tax reactionaries, the detachment effort has been Sonoma County’s first Tea Party-like movement. It is heartening to note that this dangerous anti-government “I don’t use it why should I pay for it” effort was soundly repudiated by West County voters on November 8. Although local taxes will not rise, it is likely that SWMC will require added public support from our County, State, and perhaps federal government to thrive. But a public hospital emergency room that takes all those in need 24/7 is among the most important public services that government can provide to its citizens. 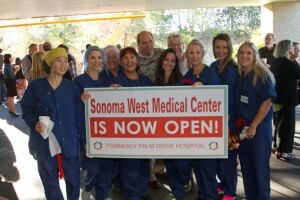 Sonoma West is the only community hospital in modern America to close and then reopen. 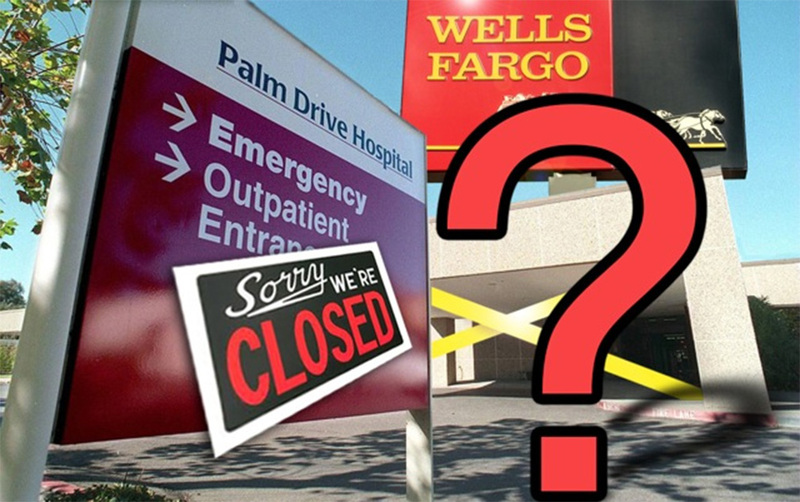 Citizens refuse to go quietly into the night of a new normal of reduced life-saving emergency room service for our growing and aging population. Thankfully, institutionalized, scarcely accessible health care and increased suffering are not what Sonoma County citizens want—or vote for! It is no small poetic justice that the man Lynda Hopkins is replacing is not just any Supervisor, but Efren Carrillo. A man who, despite his intellect, hard work and good intentions, engaged in the most notorious, embarrassing act of aggressive male behavior against a woman of any public official in years. After the one step backward for Sonoma County that was Efren’s humiliating and offensive behavior, we are now taking two steps forward. In handing over power to a women-majority board, we are transforming our local balance of power from a male majority to a no-less-efficient and likely more compassionate female majority For our community, and for our shared ecology, this is reason to celebrate. We the people of the United States will have to wait until we elect Elizabeth Warren in 2020 (hopefully no later!) to have our first woman President. But we the people of Sonoma County have just made history. It is hard to not to feel that our nation faces dark times ahead, with tragic suffering looming for our immigrant neighbors, for those in need of health care, for the poor, the working class, the middle class, and for communities of color. Donald Trump, whom I have written at length about here, won the election, and almost half the voters in America, despite his outrageous sexism, his fear mongering, his tax avoidance, his racist vilification of Mexicans and Muslims, voted for him. But Trump did not win very many votes in our community. Well over three out of four voters in Sonoma County chose Clinton over Trump (70% to 22.8%). 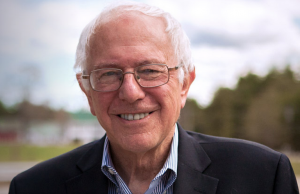 If our nation voted the way Sonoma County voted, Bernie Sanders (who won our county’s Democratic primary by 52 to 47%) would be our next President. If our fellow Americans had voted for Clinton the way Sonoma County citizens just did, she would be the next President. America would not have become a utopia overnight, but we would be a lot further along that path than the road backwards that Donald Trump will be taking our government. But we can take pride in the fact that we have gotten five steps closer to utopia locally, in our thriving beloved community of Sonoma County. And that, my friends, is reason to celebrate!